Tonight we’re eating a rustic soup for dinner. 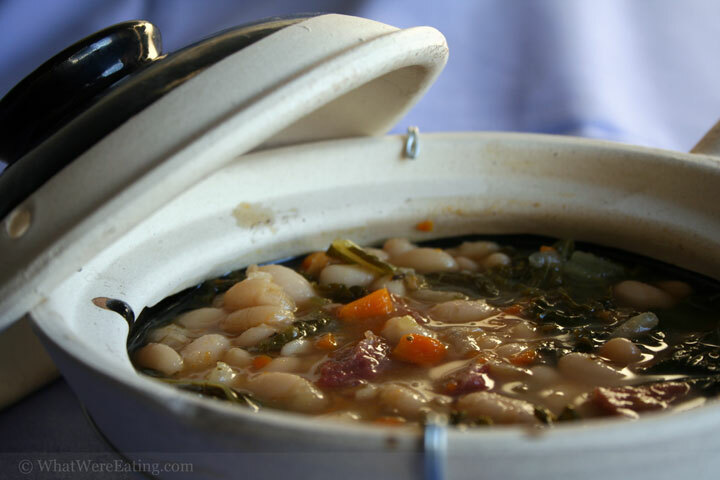 The soup was made with navy beans and fresh kale and was seasoned with smoked turkey, aromatic veggies, thyme, and a hint of cardamom and garam-masala. A hearty and healthy soupA: hey t… have you noticed that we’ve been eating a lot of southern-ish food lately? i wonder what’s inspired that in me. T: probably living in the South for the last 8 years. T: actually, you’ve lived in the South your whole life, right? Isn’t Virginia supposed to be in the South? A: yep.. i believe the rest of the country sees virginia as the south…except for the deep south. T: yeah, when you’re in the deep South, Virginia seems pretty far north. Growing up I never thought of Virginia as being Southern. A: that was definately a crazy thing for me. moving to lousiana from virginia and getting called a northerner… it still cracks me up. frankly, even where my dad lives in maryland, they consider themselves part of the south. I guess it has to do with that whole mason-dixon line thing. T: aren’t they north of the mason-dixon line in Maryland? A: i’m pretty sure the mason-dixon line runs through maryland and parts of it are considered the north and parts are considered the south. T: Well, anyway… so, what about this soup would you say is southern? T: Smoking versus Salting… I know smoking is where it’s at for me. I’d be interested to take a poll on that one. Which is your preference? A: that’s a really hard question for me. I don’t want to player hate. i really do like them both. nothing says lovin’ like a good corned-beef but smoked meat just adds such a nice flavor. i’m going to avoid truly answering this one. T: you can run, but you can’t hide! if you were on death row, and you had to pick ONE specific type and preparation of meat for your last meal. And you had 2 choices: salted or smoked. What would it be? A: uh, yeah…i’m gonna have to say that it would depend on my mood for the day. But! since i’m on death row and i might be tasting smoke for the last seconds of my life (electrocution) i might be apt to go with salted. A: i don’t know if my theory holds true (and frankly i don’t really want to know!) but i could definately see my mind going there. I wouldn’t want my last meal to keep reminding me of what was about to happen to me. T: So if you’re in a 3rd world country and you’re about to be burned at the stake, I guess grilled meats would be out for you, eh? T: so, by your definitions, what is “grilled” and what is “bbq’d”? T: ok, what if I use bbq sauce on meat that is cooked on a gas grill? is that not bbq? A: uh, i’m gonna have to go with a big old NO. that would be grilled chicken with barbecue sauce. that’s what that would be. T: well I never. i would love to hear some other opinions about what is bbq and what is grilling. I always thought they were pretty much the same (unless we’re talking about the George Foreman Grill, I don’t know what that is). A: other opinions are always a good idea, but this is a much discussed (and disputed) conversation. we are certainly not the first people to have it. i definately don’t think they are pretty much the same. definately different. note that in the south, where they traditionally used smoke to cure and preserve their meats, people generally call cooking over flames, bbq. but in the north they tend to call it grilling. i’m not an expert here, so please, no one reem me or take me too seriously, but i do think the traditional ways of curing meats has a lot to do with regional grilling terms and preferences. call me crazy. A: well.. now that we’ve hardly mentioned the star of tonights dinner, the soup… what’d you think of it, t? T: the soup was mighty tasty. It did have a nice smokey flavor (that smoked turkey was tasty). My favorite ingredient was the kale. I Love Kale. It’s just so damn tasty and healthy and nourishing and good. What’d you think? T: woman i hardly understood a word you just said. I think I got the jist though. I give this soup a 4.3/5. It was good, but I didn’t score it higher for pretty much the same reason you gave. It was good, but was a little plain. It just didn’t have that exciting splash of uniqueness that most of your cooking has. Very tasty, though, and it has made me want more more more kale! A: sweet! now i can figure out more more more recipes for kale! A: boyyyy, don’t make me go get my beatin’ stick! you know i don’t go by that damn girly shortening of my name. T: I didn’t know you had a beating stick. That’s kind of disturbing. Umm… where do you keep it? A: well now, that’s my secret. if i told you, you might use it on me! T: damn right I would. p.s. we just discussed it and came to the conclusion that the George Foreman Grill is not actually a grill, but is a tilted electric skillet with grooves. Heat a pot over medium. Add oil to the pot and allow the oil to heat up. Once the oil is hot add the diced onions, carrots, and celery (the mirapoix) to the pot. Saute the mirapoix over medium heat until the onions have become translucent, stirring frequently. Next, add the bay leaf, thyme, garam masala, cardamom,cayenne, and beans to the the pot. Stir the mixture and saute for about 30 seconds to toast the spices in the oil. Add 6-8 cups of water, the smoked turkey leg, and chicken base. Stir the soup then turn the heat to high and bring it to a boil. Once the soup has reached a boil, reduce the heat to low and simmer the soup for about 1 1/2 hours, stirring occasionally. After an hour and a half, add the torn kale to the pot. Also, if the soup doesn't look so "soupy" add more water to the pot. Now is the time when you can take the turkey leg out of the pot and remove the meat from the bone to add it to the soup if you wish. If you don't want the actual meat in the soup, that's fine too. Just leave the leg in and continue to allow it to simmer with the rest of the soup. Allow the kale to cook in the soup for another 20 to 30 minutes. Taste a few of the beans to see if they are thoroughly cook. If so, taste the broth of the soup and adjust seasoning as necessary with pepper and salt. Most likely, you won't need to add salt because the chicken base and turkey leg provide plenty, but smoked turkey legs can vary in saltiness, so taste and find out! Serve hot over rice to create a whole protein or just eat it as is. Enjoy! Soup looks yummy – can’t wait for the weather to get cooler here and enjoy some soup, too! As your dietitian, I must tell you that beans are “good carbs” as they are a good source of cholesterol-lowering soluble fiber so eat them fibery beans without guilt! I do just love having a personal dietitian! it’s a shame you’re now a few thousand miles away though. not that most readers would care, but since you’re my friend… i just found out i have impressively low cholesterol (especially since i’m not slender! ), so it must be all those great fibers and grains. Thanks you, marvelous mme H! Thanks aria! heheh i know.. monkey balls. it’s sad i get such a kick out of that. 😀 did you ever play that nintendo came called “monkey balls”? that’s a good one too. adam, smoking definately instills the most flavor into the food. I personally don’t like cooking with gas or electric grills. (we actually only own a bbq grill). 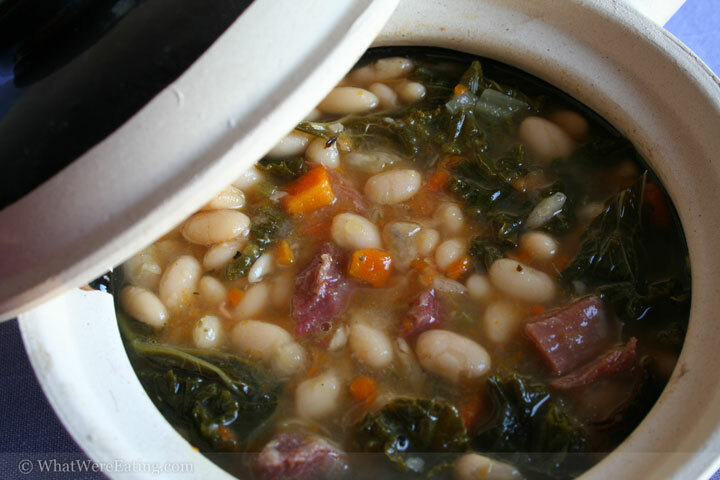 Beans, kale, soup…all my favorites! So delish…as usual! Thanks michelle! i’m so addicted to beans right now. i think we’re going to eat some again tomorrow! Wow that looks good! Right now I’m on a soup kick, I can’t get enough.